Blue Springs is a suburb of Kansas City and is located within Jackson county. It is nineteen miles east of downtown Kansas City with a population of about 53,000 residents. It is the 7th largest city in the Kansas City Metropolitan Area, and in 2010 it was ranked 49th on the list of 100 Best Places to Live in the CNN/Money Magazine. Also, any foundation repair that needs to be done can be taken care of by KC Pro to keep your home safe and sound. The pioneers found this area while they were migrating on their westward journey. They stopped their because of the abundance of cool, clean water from the spring of the Little Blue River which is where the name derived from. They decided to make a permanent settlement there and in 1880 Blue Springs was made the fourth settlement in the county. KC Pro proudly provides foundation repair in Blue Springs MO and for the surrounding areas. If you notice that your home is having foundation problems such as cracks, leaning walls or chimneys, or sinking foundations, then KC Pro can be your solution. These can result because you may have a soil-related disturbance in your home. Soil-related disturbances tend to be a large factor when needing foundation repair. Poor compaction, overloading, and excessive materials that expand and shrink with the changes in the moisture content greatly impact the amount of stress on your home’s foundation. KC Pro has several foundation repair systems to overcome the damage already done. All of these issues can be extremely intimidating for any homeowner, but if you contact the right repair company you won’t have to worry any longer. KC Pro uses proven techniques and products to guarantee that your home is returned to prime condition. The most common and effective procedure for combating foundation settlement is underpinning. We will use helical and steel piers to provide additional support for the foundation of your home. The piers are driven deep into the soil underneath your home until they reach the stable footing of bedrock, from there, the opposing end is propped underneath the foundation, essentially propping it up. All of our foundation repair products are provided by ECP, the best in the industry. You can rely on our repairs to last you a very long time. Not only does the professionals at KC Pro handle your foundation repair needs, they also take care of your basement waterproofing needs as well. If you find that your home is dealing with leaks in your basement walls or if your basement floods every time there are heavy rains, then you are in need of basement waterproofing. Take a look at our basement waterproofing services. We are glad to take care of your basement waterproofing problems whenever you need us to. Water seepage is a nightmare for any homeowner, bringing both water damage and possible mold growth. At KC Pro we have the waterproofing products to make sure that your home stays dry in the wettest of weather. We can provide your home with a sump pump, drainage system, and crack sealant. Every situation is not the same, that is why we will assess your home’s condition and determine the best solution for you. 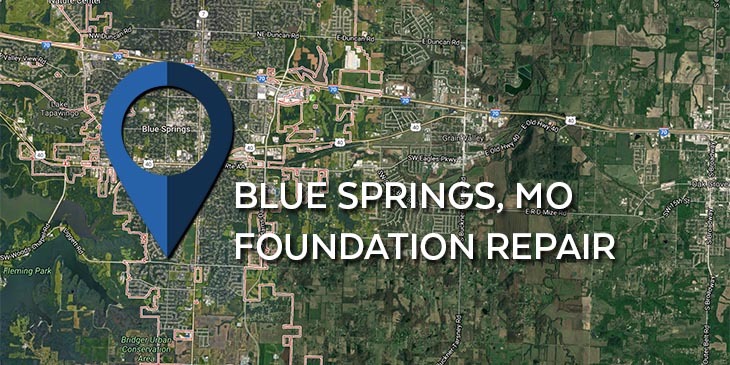 If you are in need of foundation repair Blue Springs MO or in the surrounding areas, then contact us today at KC Pro.